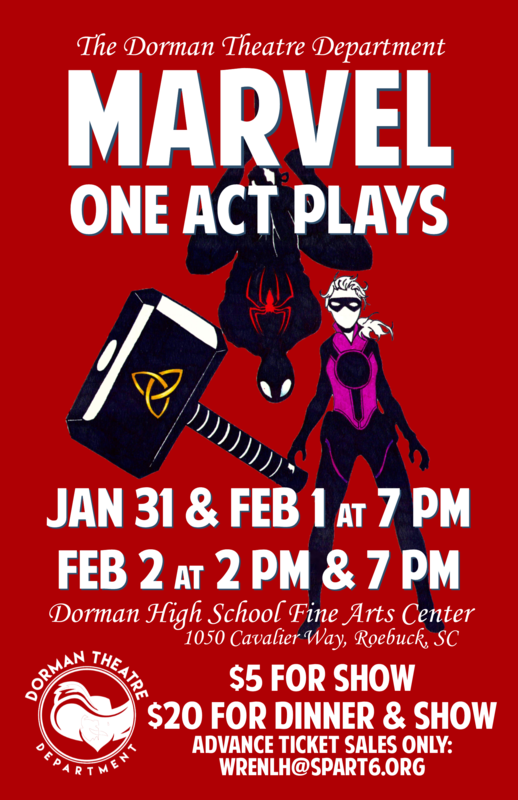 The Dorman Theatre Department proudly presents the Marvel One Act Plays tonight at 7pm and Feb 2nd at 2pm and 7pm. PLEASE TAKE NOTE *****The Marvel One Act plays are recommended for high-school age students and adults. The content of these plays involves sensitive topics including suicide, assault, depression, and alcohol. The intended message is that everyone can be a superhero by finding a way to help others who are struggling with these issues. The plays are not recommended for children younger than high school because of the nature of the content. If you or anyone you know needs support dealing with the issues covered in these one-act plays, we encourage you to speak with a trusted adult, school counselor, or administrator.